Last year, more than seven million people got swept up in the YouTube video of a wedding dance, capping a love story that almost didn’t happen. The romantic gesture showcased Kirk Henning and his groomsmen dancing for his new wife, Valerie Tellmann, during the couple’s wedding reception in July. But it wasn’t just the dancing that resonated with folks. It was what the moment represented. Kirk and Valerie’s story begins years before they met. 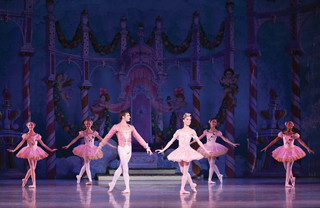 The two members of Richmond Ballet grew up in different parts of the country – Kirk outside of Chicago, and Valerie in Oklahoma, and later Richmond. Both started dancing at an early age. While a student of The School of Richmond Ballet, she had the opportunity to audition for The Nutcracker and played a mouse. “That’s when I fell in love with ballet and I never looked back,” she says. Kirk enjoyed Valerie’s bubbly, magnetic personality. “It was one of the first things I remember about her and that I still love about her today,” he says. They were at two very different points in their lives, so they decided to take a break from each other. Valerie dated other men but “Kirk was definitely the one she was comparing anyone to,” her mom says. Kirk began writing Valerie letters and coming back to town to visit old friends. “I was still freelancing, but I knew if I wanted to make it serious, I would have to move back to Richmond,” he says. She looked for red flags, clues that he was still a free soul, but they never came. “He was making an attempt to be part of my daily life,” she says. Even though there was no engagement ring on Valerie’s finger, marriage was a given. They both regard the day in June 2014 when they locked in a wedding date at Cathedral of the Sacred Heart as the beginning of their engagement. But Valerie still wondered when Kirk might officially pop the question. For that, she would have to wait until September. Planning the perfect moment was challenging for Kirk. “Valerie has an outgoing personality and I wanted something fun. I couldn’t do it over a salad or a dinner,” he says. He knew he had to make the gesture on Labor Day before he left town for work. He planned to ask her in front of the graffiti wall along the Canal Walk, one of their favorite haunts, while Valerie’s friend was taking engagement photos of the couple. Valerie knew something was up when she saw her friends slip around the corner with bottles of champagne. Suddenly, Kirk dropped to one knee. Fireworks followed. “I was through the moon,” Valerie says. That November, Kirk came back to Richmond for The Nutcracker. The couple danced as the Snow Queen and King. For the next several months, Kirk, who was traveling, dancing and taking classes, helped with the wedding plans, working on everything from the website and contracts to the guest list and financials. “He was proactive,” Valerie says. As the planning progressed, Valerie showed Kirk some groomsmen dances on YouTube. “I was not about it,” Kirk says. He slowly began to realize how hard Valerie was working on the wedding and he appreciated the little surprises she had planned for him along the way. “She was amazing at planning it,” he says. In April he emailed his groomsmen to ask if they would be willing to participate. They all said yes, including the four non-dancers in the group – Kirk’s two brothers and brother-in-law and Valerie’s brother. 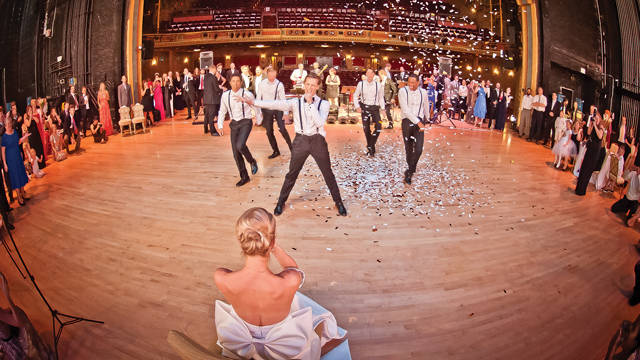 The other four groomsmen were members of the ballet company. Even though he was uncomfortable about dancing, he wanted to do it as a tribute to his sister and to his future brother-in-law. “I was thankful for the opportunity, as nerve-racking as it was,” he says. Once the video hit YouTube, it blew up. It was featured on a variety of websites including CNN.com and The Huffington Post. “Good Morning America wanted to fly us to New York City but we couldn’t do it,” Valerie says. The couple did do an interview with Inside Edition and Sunrise Australia. “It was crazy. People in Australia cared about it enough that they got us to do an interview,” she says. Kirk believes the video’s popularity is directly related to the fact that “people enjoy seeing the visualization of what love is for some people and I think that is what resonates the most,” he says. It definitely had an effect on his new wife. “I thought I couldn’t love Kirk any more, but with all the effort and then after hearing about everything he put into it, it made me think I am the luckiest girl in the world,” she says. The two newlyweds will dance together with Richmond Ballet in one of the greatest love stories ever told, Romeo and Juliet. Shakespeare’s tragic tale is known for the emotions that rule the human soul: love and hatred. Valerie will play Juliet opposite Kirk’s Romeo. Richmond Ballet’s Romeo and Juliet will be performed February 12 through 14 at Carpenter Theatre at Dominion Arts Center.